This raid begins with Tublik Narwethar (click for map image) in Kod'Taz (southwestern part of the zone) at about /loc -2000, 1275, -348. - If below Level 65, must have beaten the Tipt group expedition. - If Level 65 or higher, there are no known participation requirements. The instance zone-in is in the northwestern quadrant of the zone. 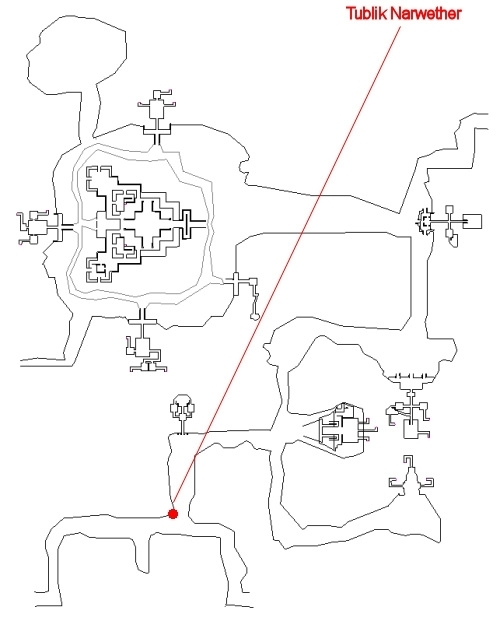 It's the temple due south of the giant temple, so you can have your raid meet there ahead of time while the requester gets the expedition. Requesting the expedition requires that you be in a raid format (/raidinvite) and have at least six players in the raid (must be online, but don't have to be in the zone; levels don't appear to matter). I'm sorry, but you don't have enough comrades with you to venture into this dangerous area. Come back when you have at least six groups of friends to join you on this perilous journey. - Say "Sanctuary of the Righteous" to trigger the expedition. 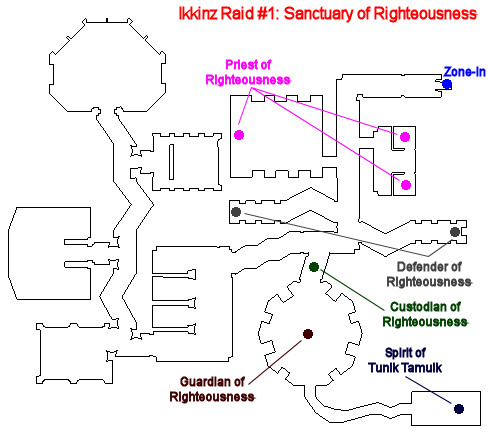 - The instanced zone is entered through the south temple in the northwestern quadrant of the zone. - Inside, Kill 2x "Priest of Righteousness" in the first room on the left. --- They leash. These are unslowable and infuriate at 50% and 10% (AE rampage). - Kill the Priest of Righteousness in the room across the hall from this one. It is unslowable and infuriates at 50% and 10% (AE rampage). - Kill the Defenders of Righteousness in the two rooms further down the hall. These are unslowable and have single-target rampage. - Open the door to the Arena-type pit. Right behind it is the Custodian of Righteousness. - Kill the Custodian of Righteousness (unslowable and flurries; hits very fast). - In the middle of the pit is the Guardian of Righteousness. Once aggro'd, the Crumbling Monuments up top become active. --- The Crumbling Monuments become inactive after the Guardian dies. - The Crumbling Monolith at the very top now becomes targettable. Charge it and kill it. Loot the shawl it drops. - Go past where the Crumbling Monolith stood, down the hallway, and into the crypt where you will find Spirit of Tunik Tamuik. - Give the shawl to the spirit in order to activate the mob. - Kill the Spirit of Tunik Tamuik, and loot an artifact off the bones which spawn. Ikkinz, Chambers of Righteousness is now available to you. Unlike the group expeditions, this raid has no lockout timer upon request. Here, you receive a 12-hour lockout timer upon the death of whichever "Priest of Righteousness" drops stat loot. You receive an additional 12 hours of lockout time upon the death of the "Custodian of Righteousness", an additional 24 hours upon the death of "Guardian of Righteousness", another 12 hours upon the death of "Crumbling Monolith", and another 36 hours upon the death of the "Spirit of Tunik Tamuik" (for a total of four days if you complete the entire expedition). Named mobs have a chance to be up as soon as you zone in. Base mobs in this zone tend to hit for a max ~1,850 to 2,000. Most are mezzable and stunnable. The three hallway roamers appear to respawn, but no other mobs are known to do so. These mobs are tethered to their rooms. One appears where the Diabolic Destroyer does in its expedition; the other two appear where the priests do in the Twin Struggles expedition. They each hit for a max ~2,400 and "infuriate" at 50% and 10% (AE rampage for several rounds). Priest of Righteousness has been slain by _____! The Priest of Righteousness topples over to one knee before falling to the ground. He has failed his duties to the Guardian of Righteousness. You'll get one item of loot out of these three mobs' deaths. Kill 2x "Defender of Righteousness" (one at the end of each hallway extending out of the main hall). These hit for a max ~2,600 and single-target rampage. They don't drop any loot. Defender of Righteousness has been slain by _____! The Defender of Righteousness can no longer fulfill its duty to the sanctuary. You are closing ever-nearer to your final destination. This locks the door to the arena area at the south end of the main hall. Behind it is the "Custodian of Righteousness". The Custodian, unlike other nameds here, is not leashed or rooted. It hits for a max ~1,500; flurries; hits very fast; infuriates at 10% (AE rampage); and has a mem blur effect. It drops one item of loot. Custodian of Righteousness has been slain by _____! The Custodian of Righteousness has fallen! Its death has alerted the Guardian of Righteousness to your presence! The Guardian of Righteousness hits for a max ~3,600; is perma-rooted; summons when damaged; has ~500,000 hitpoints; summons adds ("Crumbling Monument") about one every 20 seconds; and casts "Throw"; "Bury"; and "Stone Vortex". Guardian of Righteousness has been slain by _____! As the guardian comes crashing down, a new threat presents itself to you. A crumbling monolith prepares itself to stop you from progressing any further! It drops one item of loot. The Crumbling Monolith hits for a max ~2,500; is perma-rooted; summons when damaged; and had ~200,000 hitpoints. It drops one rune + "Decaying Spirit Shawl" (turn-in item to activate the final named). Crumbling Monolith has been slain by _____! The death of the crumbling monument has caused the stone in this room to stir slightly. You hear the clunking and grinding of stone against stone as something is seemingly unlocked. Click on the pillar behind the Crumbling Monolith to reveal the path to the crypt. The area is safe, so you can move in. You have found the hidden entrance to the crypt! The statue moves to the side to allow entrance to the dank hall beyond. Spirit of Tunik Tamuik shimmers momentarily as though he were somehow changing. It hits for a max ~3,600; is perma-rooted; summons when damaged; and has ~620,000 hitpoints. It drops two items of loot. Spirit of Tunik Tamuik has been slain by _____! The Spirit of Tunik Tamuik has been defeated! You have sent his remaining spectral essence to rest. A feeling lingers that he may once again return to defend this sanctuary from evil doers and to continue to test the priests of the trusik people. "a pile of bones" spawns nearby. It contains 4x "Artifact of Righteousness" (Gates of Discord progression item). I can get into Anguish with 6 chars in a group who don't have to be online and don't even have to be flagged or high level; two of them were 58. But for this you need to be online and in a raid and be flagged or high level. Stupid. what is the minimum number of people required to get the ikkinz raids these days? did they make it 6, like for anguish / mpg instances? you just need to be in a raid - done it several times with just 6 chars. I tried to get this with one group and he told me I needed 6 groups of friends. I raid invited another group of 4 people and was able to get the first raid. Dunno if you need more than 6 people or if you have to be in raid to get expedition.